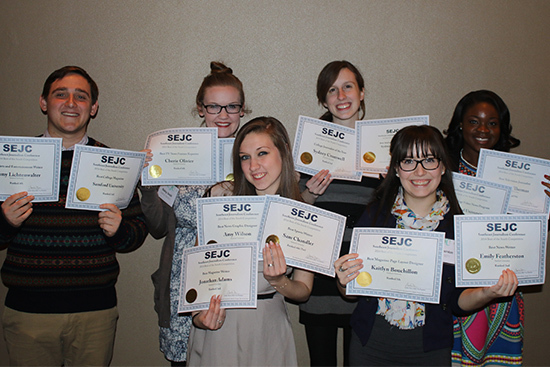 Samford University journalism students won multiple honors for their work in student media at the Southeast Journalism Conference (SEJC) Feb. 27-28. Samford earned 15 awards in the Best of the South Collegiate Competition, in which 33 schools and 523 students competed. Sydney Cromwell, a senior journalism and mass communication major from Murfreesboro, Tennessee, won fourth place in the category of Best Multimedia Journalist, third in the category of Journalist of the Year and first in the Sports Photojournalism Championship. Emily Featherston, a junior journalism and mass communication major from Lookout Mountain, Tennessee, received an honorable mention in the Page Layout Championship and won second place in the category of Best News Writer. “I think this competition just serves to demonstrate the strength of the Samford JMC department,” said Jimmy Lichtenwalter, a junior journalism and mass communication major from Johns Creek, Georgia. Lichtenwalter placed fourth in the Best Arts & Entertainment Writer category.